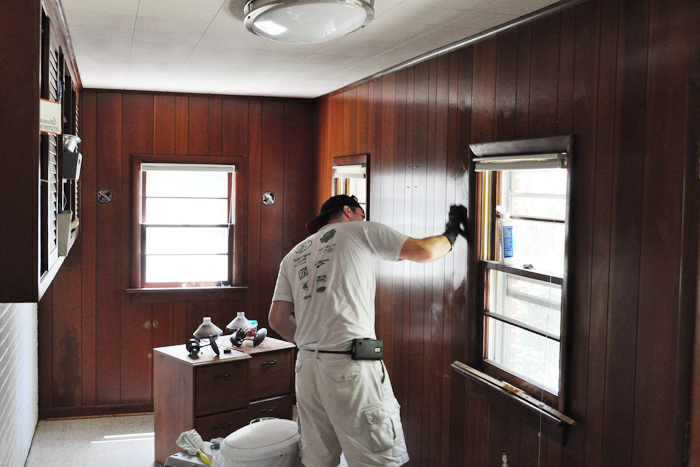 Get Into The Groove: How To Paint Wood Paneling. 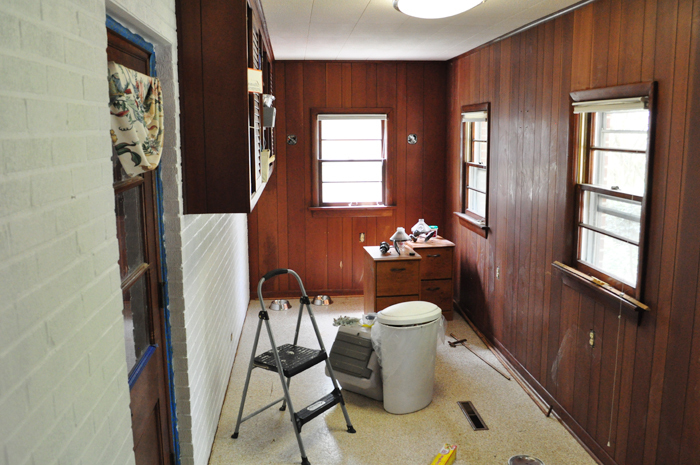 It’s probably about time I show you what’s been happening with my laundry room. Okay I guess we really only have that one thing to bear in mind. 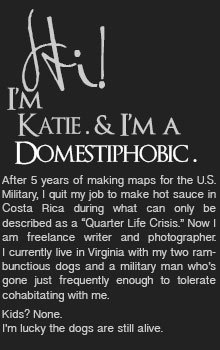 Our home is already one of the priciest for its square footage in our neighborhood, and since Justin is still Active Duty Air Force, the odds are very slim that we’ll stay here long enough to recoup all of the extra money we spend. 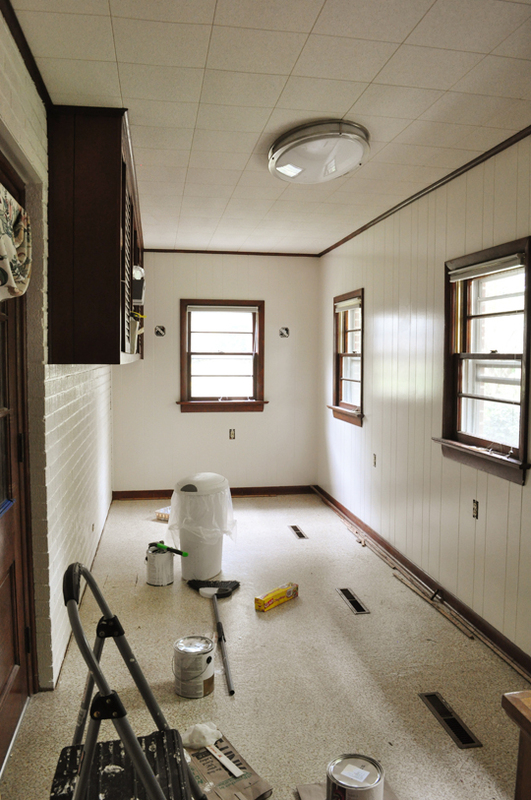 This means it’s important that we keep renovation projects reasonable for our neighborhood and concentrate on things that will add immediate value. So while I’d love to go all glitz and glam in this room with some high-end tile work, fancy lighting, and a manicurist who emerges from a hidden wall panel at the press of a button, it’s just not going to happen. 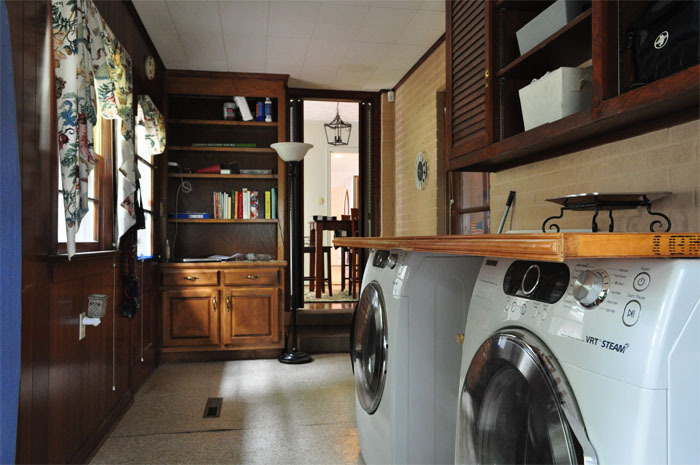 This photo is taken from the dining room, looking into the would-be laundry room. 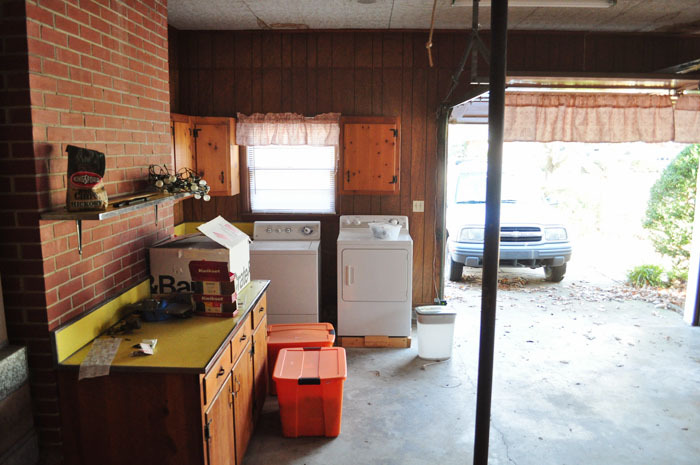 The door to the garage is just inside this room to the left and the doorway to the back yard just inside this room to the right. 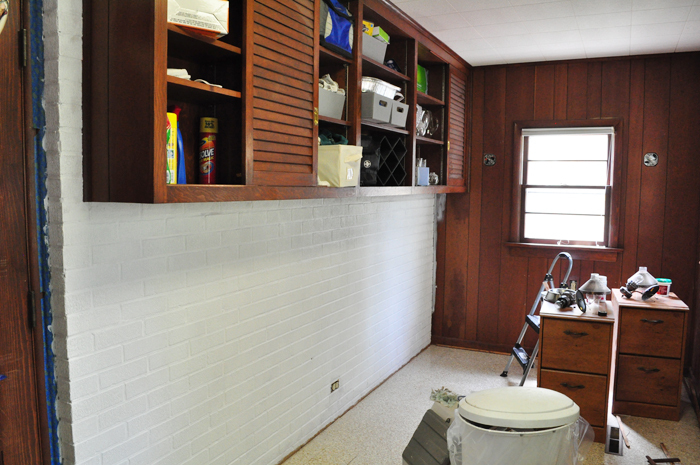 So our first round of improvements involved cleaning and rearranging this space to make sense as a laundry room. It looked better, but even after scouring it still smelled like cat pee. 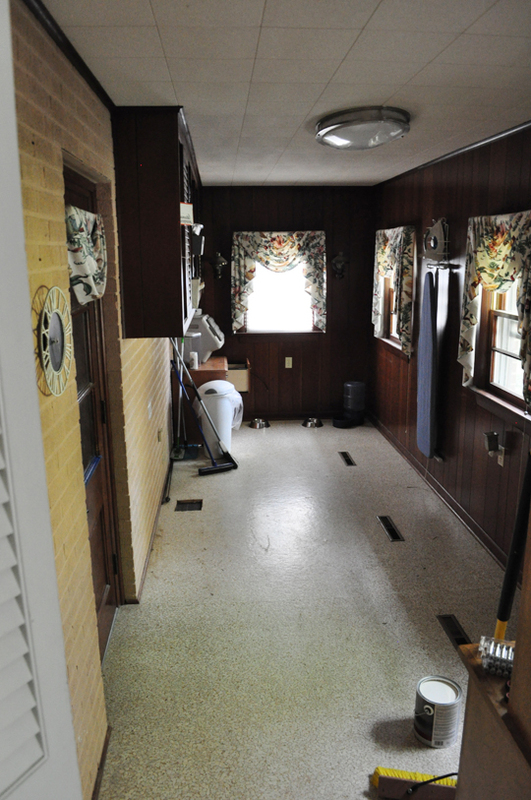 Last year our trusted plumber quoted us $1,200-$1,300 to run the water and drain to this room. 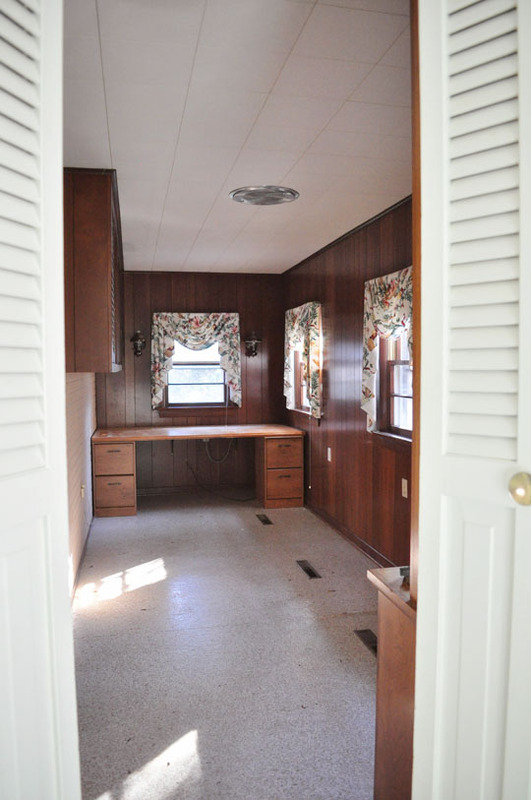 The problem is that it doesn’t have a crawl space, even though it’s 4-ish feet off the ground. They left about a foot of air space for ductwork beneath the subfloor and then filled it in with cement. Probably to keep anyone from ever finding the bodies. So our plumber is going to have to get creative and run his pipes through the garage. 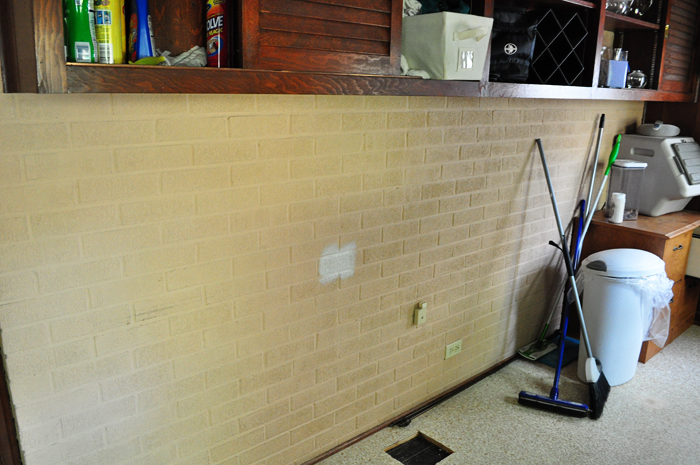 And as much as I’d love to have the washer and dryer located on the far wall beneath the window, placing them against the brick wall that backs up to the garage is our only option to ensure proper slope for drainage. 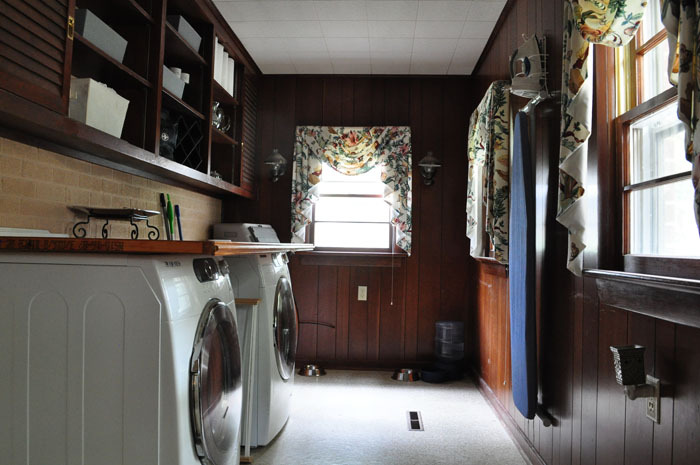 It will all be worth it though, because an indoor laundry room will absolutely add value when it comes to re-sale. It’s kind of hard to tell in the photos just how oddly fleshy pink that wall was, but it was disturbing. I didn’t realize how disturbing until we started painting it. I had almost an entire gallon of expensive cabinet paint (Benjamin Moore’s ADVANCE) left from the kitchen remodel, and since I knew it would work really well on the wood paneling (which had a smooth finish very similar to the interior panels of my cabinet doors), we just went with that. Off-white wouldn’t have been my first choice for “color” in here, but money is money, people. 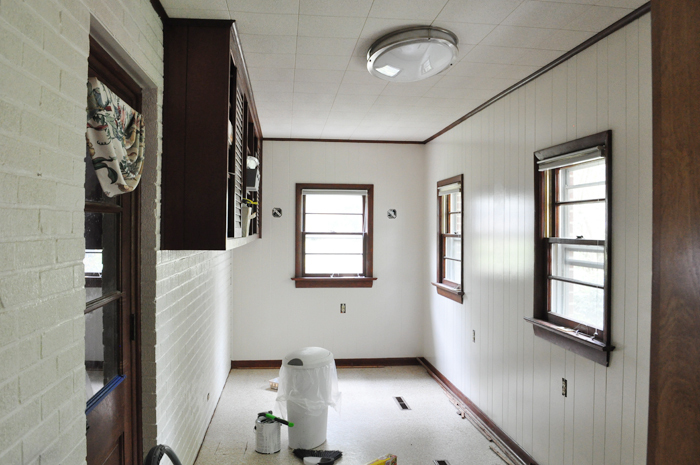 It needed a second coat, but even just one was a vast improvement. 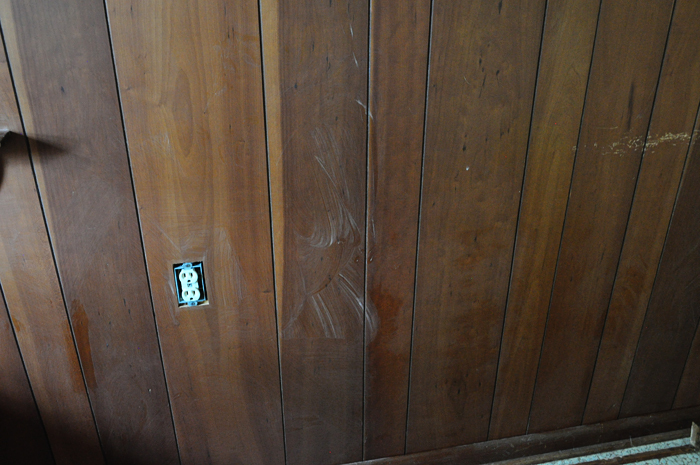 Plus, the paneling wasn’t in great condition. The white streaks are from the deglosser, but there were also some massive scratches across these old walls. The room feels much, much brighter now. Lighter, cleaner, and the cat pee smell was almost gone. 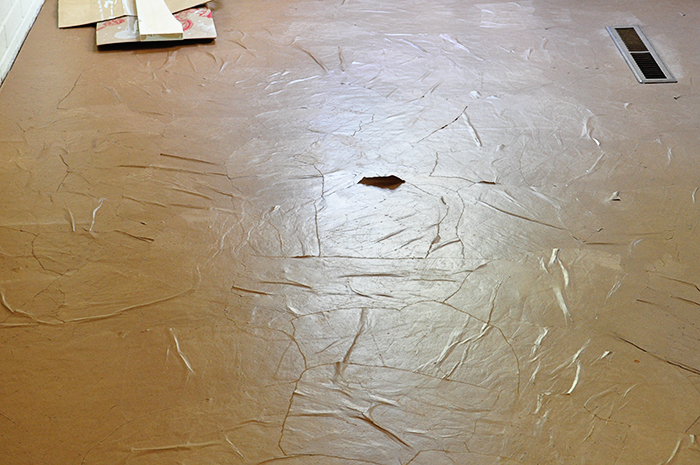 After filling in some divots and gluing down peeling seams in the existing worn linoleum, Justin wanted to try the brown paper treatment to cover it. We used weights to hold down the seams for several days so the glue would set. 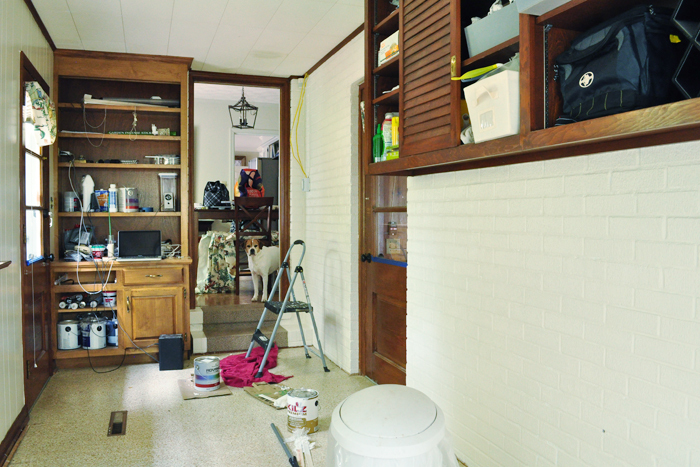 We needed something flat (so we wouldn’t have to mess with the thresholds in our two exterior doorways) and cheap. I wanted to paint over them, but even with a high quality porch paint, the surface would likely scratch and mar within a few weeks thanks to a couple of 60-pound mutts who frequent this space. 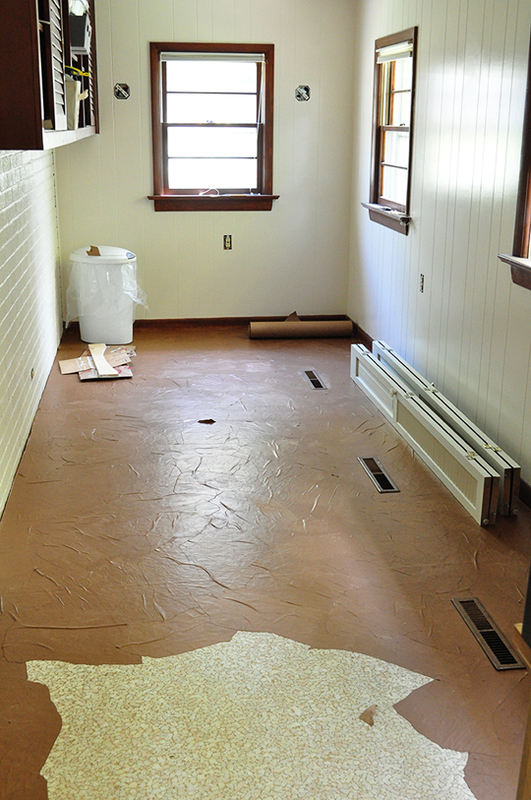 The brown paper flooring, however, was supposed to be fairly durable once coated in exorbitant amounts of polyurethane, and who doesn’t love the look of old leather? 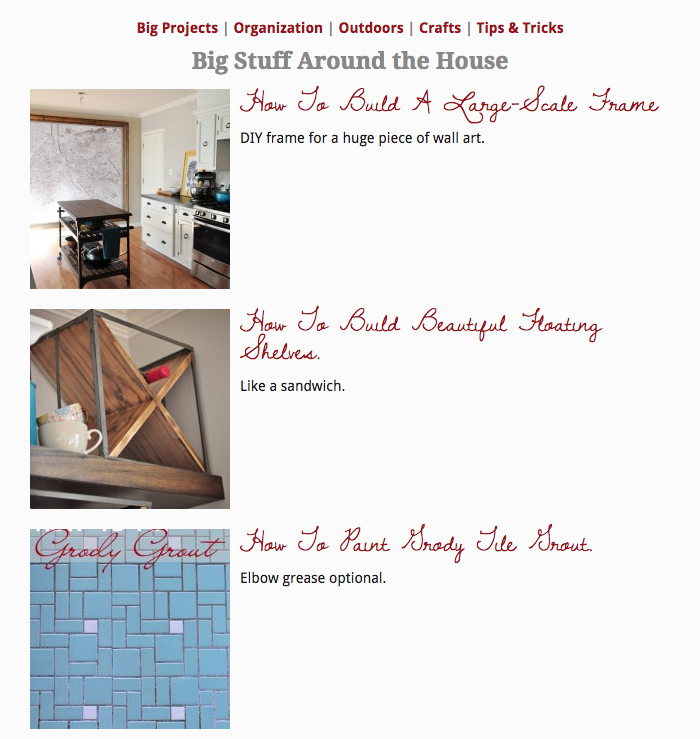 If you’re subscribed to my mailing list, you already know how that experiment went down. In fact, it bubbled and peeled like sunburned skin and pretty much stayed that way. So we had to come up with something else, pronto, because our plumber was not-so-patiently waiting to get started. 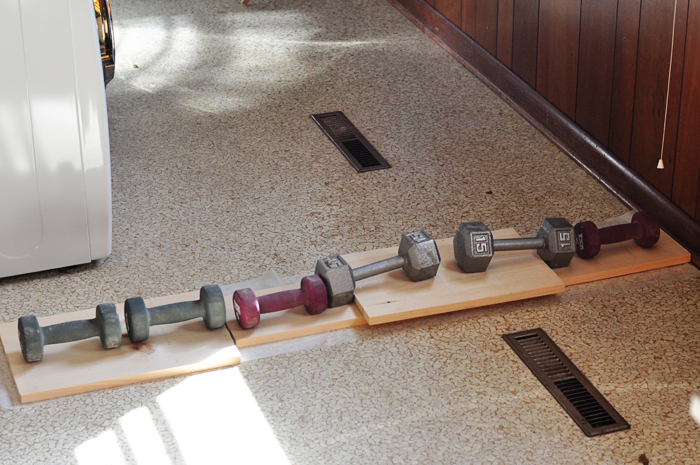 What we ended up using is actually my new favorite DIY flooring material but that, m’dears, will have to wait for another post. Looks wonderful!!! Love it!!! 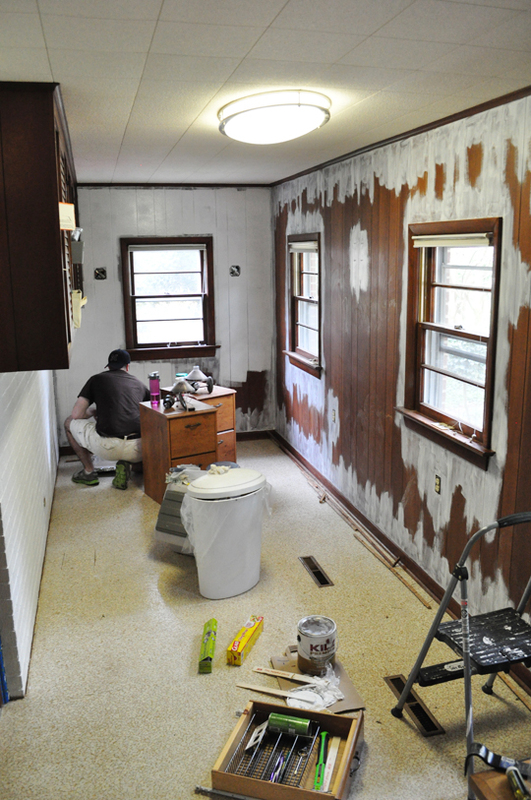 We painted over wood paneling too…anyway…..y’all did a great job. It is hard work…but so satisfying! Your before and after pics are so fab. Hope you are doing well! I know I’ve been a bit MIA lately — we’ve had visitors and have been doing a lot of local traveling. I hope all is well with you, too! Was the cat pee smell *really* that bad? ?